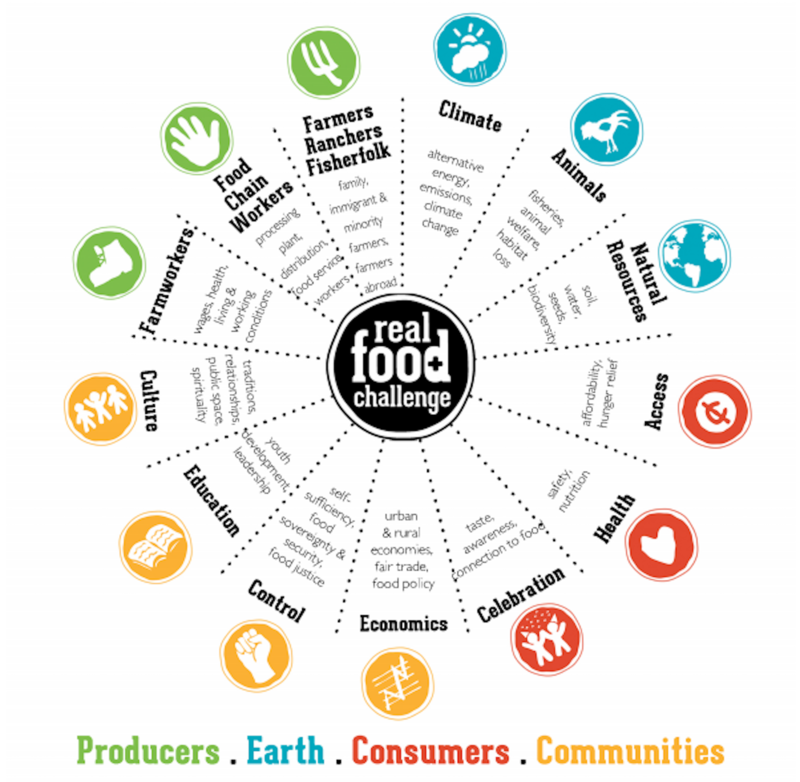 Real food truly nourishes producers, consumers, communities, and the earth. In a world where pizza is a vegetable and you can buy everything “green,” it’s vital that we stand together around strong standards for sustainability and social justice through our definition of Real Food. Practically speaking, it is impossible to measure our progress if we are not all using the same standards and metrics. So what are the values behind the Real Food Standards? Let's take a look below! Those working in the fields, oceans, and mountains, both domestically and abroad, are subject to unfair, discriminatory agriculture policy and practices. We are fighting for a future where dignity and respect are mandatory in transactions with your farmers, ranchers, and fisherfolk. Food justice throughout the food chain includes safe working conditions and a living wage for our distribution, processing, and retail folks. Fair pay, safe working conditions, and access to resources for a healthy, dignified life for farmworkers are necessities in a just food future. Culturally appropriate food practices, rituals, and spirituality is what brings life to the food we eat and the land we work. Culture begins and ends with our food, water, and seeds. An education unhampered by corporate forces is a first step in having truthful stories of our past come to light, and where a bright and dignified future is nourished. Looking to one another for support and power is where the real education can begin. Food sovereignty, self-determination, and self-sufficiency are pillars of our vision. To be in control of our destiny through food, seed, and land are essential for honoring both our past and future. Food justice is not complete until economic justice takes center stage. Throughout the entire food chain, fair and just transactions for goods and services, are the keys to a just food future. Climate change is one of the greatest dangers affecting our generation. Impacting coastal, communities of color specifically, Real Food prioritizes regenerative agriculture and clean energy to mitigate the devastating impacts of climate change in our places. Protection of habitat, humane animal treatment, and responsible protein harvesting are key staples of RFC. Protecting our animal-landscape-human relationships are vital for a just agriculture food chain. We are nothing without the land, water, air, and seed that provide us life. To fight for the protection of our resources, is to fight for life. Access to nutritious, nourishing food is a human right. So is access to land, water, and markets to ensure a prosperous livelihood for producers. Nutritious and safe water and food are human rights that cannot be ignored. Every person, everywhere has a right to the resources to maintain their body, and thrive in their environment. Food is where our celebrations, ceremonies, histories, and bright futures come together. A movement without dance and laughter is no movement we care to partake in.